Stay up-to-date with the latest news and announcements from CoLAT. ‘We welcome everything in this section and none of the policies or intentions should be watered down. We welcome the inclusion of thinking about the World Heritage Site at the Tower of London. We welcome that there now seems to be widespread agreement that a responsible approach to its heritage can enhance the City of London in the eyes of commercial and private visitors, and make it an enviable place in which to work and live. There is however always room for improvement. Two points at the practical level. First, in 6.4.23 you mention the usual requirement that developers pay for all the archaeological work on their sites, including publication of the results. Unfortunately publication, being at the end, is still too often squeezed for resources. Some important projects lie in archive because the money ran out. Archaeologists are grateful to developers for meeting their responsibilities, but a little more effort and generosity is required. Second, in paragraph 6.4.18 and Policy HE2 you say that the Corporation will 'enhance archaeological monuments'. We draw your attention to the removal, over time, of several of the plaques about the City wall along the City wall walk. These should be reinstated. Third, and this is more a general comment than one on a particular paragraph, the Trust suggests that the time is now right for a Deposit Survey of all the historic strata in the City, from the Roman period onwards, to be commissioned. This would produce a 3D-model of the resource, and be of use to planners, developers and archaeologists preparing projects. The last such Survey was in 1972. It is little known that the archaeological resource in the City is in places over nine metres deep. 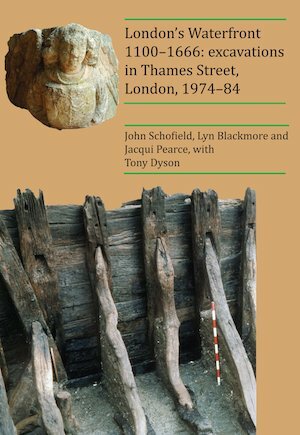 On 30 April 2018 Archaeopress and CoLAT published London’s Waterfront 1100–1666: excavations in Thames Street, London, 1974–84 by John Schofield, Lyn Blackmore and Jacqui Pearce, with Tony Dyson. This monograph presents the archaeology and history of a number of medieval properties and the parish church of St Botolph Billingsgate, which was destroyed in the Great Fire of 1666 and not rebuilt. It is based on four excavations by the Museum of London in Thames Street in 1974 to 1984. The press release for the publication is on the page dedicated to this project, London Waterfront. Here also you will find the whole 550-page text as a PDF file, available for download free, and supporting archive files, interim articles and a link to the BBC Chronicle film made about the largest excavation reported here, Billingsgate, in 1982–3. Shining New Light on Roman London. 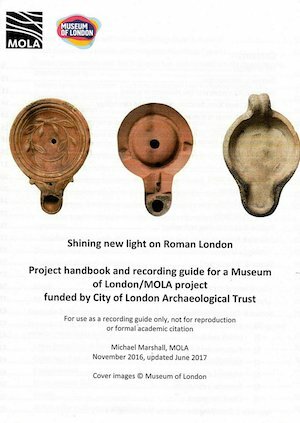 CoLAT has supported the writing of a project handbook and recording guide for Roman ceramic lamps, based on the many examples excavated in London, by Michael Marshall of MOLA. This was first published in November 2016 and updated in June 2017. It is a guide for use by all archaeologists to the description and classification of Roman ceramic lamps from London, and it can be used on other Roman sites. It helps the investigation of the function, use and technology of these important objects. The Shining New Light on Roman London project is still in progress, and comments on the guide and its use are welcome. You can download the illustrated text here (PDF, 4.6Mb). £4915 to Lyn Blackmore of MOLA to study and publish 'The imported pottery from the Tower Postern.' The southern tower of the medieval postern gate of the City of London was excavated in 1979, revealing a cellar that survived its collapse around 1430 which yielded a vast assemblage of pottery. This includes the first major collection (about 1140 sherds) of 13th- to 16th-century imported pottery to be found in a closed, non-waterfront context on the north bank of the river outside the City of London. The group is of international importance for the wide range of forms and sources present (including Italy, Spain, North Africa, France, Germany and the Low Countries). It also represents a later period of dumping than is found along the city waterfront (where legislation and the construction of lengths of riverside wall from the 14th century onwards made it difficult to discard rubbish in the river) and, unlike contemporary riverside landfill dumps, was protected from disturbance and erosion, so that it can be reliably taken as a stratified sequence of deposition. This proposed study of 13th- to 16th-century imported pottery can be used to considerc hanges in the contemporary economy, the movement of people, goods and ideas, distribution and consumption, and how these were affected by the discovery of the 'new' world. £1912.50 to Rachel Cubitt of MOLA for research on 'Spoons from Londinium'. This research arises out of recent finds of lead-alloy Roman spoons at several sites. Recent publications have considered the form, capacity and decoration of spoons and the specific characteristics of different materials such as colour, taste and affordability, along with evidence for use-wear. The London spoons will be assessed against each of these criteria. Re-examination of the spoons from MOLA sites and the MOL collections is necessary to consider the capacity of the bowls and if they show signs of use wear. The potentially Bacchic nature of the decoration on the spoons should be evaluated in light of other Bacchic material from London, and consideration given to the finds spots of these spoons compared to the other Bacchic material and to sites thought to be associated with his worship. £4720 to Rebecca Gordon of MOLA for research entitled 'Detecting London's migrant community: Jewish food and cultural identity.' From 1066, there was a known Jewish population in the City. This phase of occupation lasted up until their expulsion by the Crown in 1290 and they were not formally permitted back into England until 1656. Although there is a wealth of historical evidence for London's Jewish community, archaeological evidence has been sparse. Although the recovery of Jewish material culture has been limited, the potential of faunal remains to detect cultural groups is yet to be fully explored. Yet food is an important marker of ethnic, religious and social identity: its archaeological value stems from the high preservation potential of food waste and the fact that such expressions of identity are made on a daily basis. Although previous attempts to identify London's Jewish community using animal bones have proved unsuccessful or inconclusive there is scope to explore whether butchery marks and body parts can indicate the the method for slaughtering and preparing meat according to Jewish dietary laws. Zooarchaeological investigations of animal bones from areas with a known Jewish population has shown that the predominance of body parts (i.e. forelimbs) and butchery evidence can be useful identifiers for Jewish occupation. This illustrates how animal bones can be used as an important investigative tool in recognising cultural groups by focussing on distinctive faunal signatures. Once the framework has been developed and tested, the intention is to apply it to other sites in England where Jewish activity can be formally identified; particularly in areas/ periods where their presence made have gone undocumented (i.e. after their expulsion). CoLAT has now placed on its website the text and figures of a major archaeological and historical study, London’s Waterfront 1100–1666, by John Schofield, Lyn Blackmore and Jacqueline Pearce with Tony Dyson. This can be found at London’s Waterfront. It presents excavations by the Museum of London in the medieval waterfront area of the City of London south of Thames Street in 1974 to 1984. This is a new form of archaeological publishing. The large report and its illustrations form the main online element; the current edition is of June 2017. This can be cited as an academic work by researchers, but will probably be added to and refined in the future as further research is done. Also online here are supporting files which encourage and enable researchers to examine the archaeological data, of buildings, waterfronts and finds, to undertake their own research. There is also a link to a 50-minute BBC programme made about the Billingsgate excavation, broadcast in 1983. CoLAT hopes that all this is an archaeological resource which will be used by others, and so it will grow. At the same time, conventional publishing in paper and ebook form is being discussed with the publisher Archaeopress. Because of the volume of the existing report, with its illustrations and many tables, the conventional report may have to be only the majority of the primary text. The online version will in any case remain for consultation. London will be a more attractive world financial centre if it is seen to look after its historic buildings, monuments and evidence of its past. CoLAT is now regularly consulted by the City of London on proposed changes and improvements to all kinds of policies concerning the City, but especially on archaeology, conservation and the environment. Recent consultations have been about several Conservation Areas, the City churchyards and the Supplementary Planning Document (SPD) about the conservation and management of Leadenhall Market. By making its comments, CoLAT helps to find ways to integrate the City’s historic assets into the modern townscape. The Secretary of CoLAT, John Schofield, is also Cathedral Archaeologist for St Paul's Cathedral. In 2016 he published St Paul's Cathedral: Archaeology And History with Oxbow Books. This is a study of the Wren building, from the start of its construction in 1675 up to the early 21st century. Archaeology, conservation, and engineering aspects are covered. 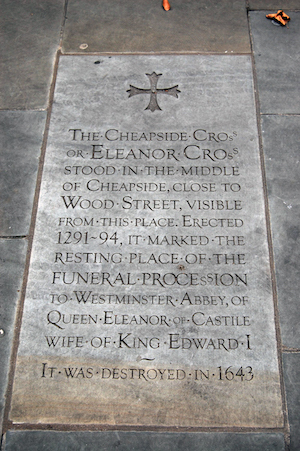 In 2015 the Corporation of London placed an inscribed memorial stone on the ground surface on the churchyard of St Mary-le-Bow, Cheapside. 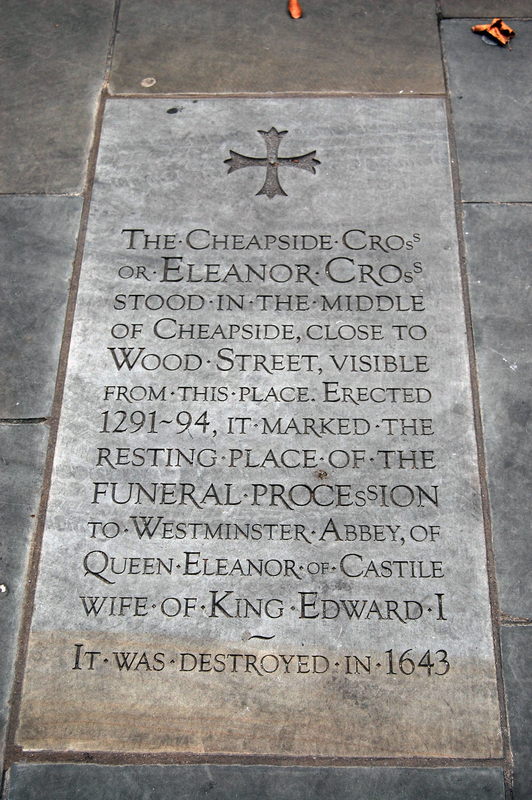 This commemorates the Eleanor Cross of 1291-4, a notable medieval monument which stood nearby in the centre of Cheapside until its destruction in 1643. Parts of the Cross are on display in the Museum of London. CoLAT welcomes this development of a network of plaques and monumental memorials which is crystallising in the historic City of London. Nearby is a larger example, the outline of most of the 14th-century cloister and octagonal chapter house of St Paul's Cathedral, south of the nave of the Wren building. CoLAT has awarded the Rosemary Green Grant, comprising £80,000 over three years, to Jelena Beklavac and her team at the Centre for Human Bioarchaeology of the Museum of London, for the project The impact of industrialisation on London health. This is the largest single grant ever awarded by CoLAT, and derives from a substantial bequest made to the Trust by Miss Rosemary Green. For details of the winning project, see the Rosemary Green Grant page. CoLAT and the Corporation of London have produced a short guide to a walk around the City of London, evoking some of its Roman highlights. This is one of a series being produced by the Corporation to encourage exploration of the City. The Trust's Secretary John Schofield provided the text and designed the walk. 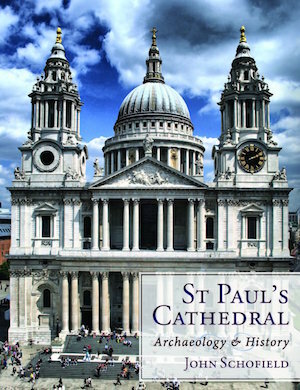 The 14-page folding leaflet is available free from the City's Information Centre in St Paul's Churchyard; and is available to download (PDF, 2.9Mb).